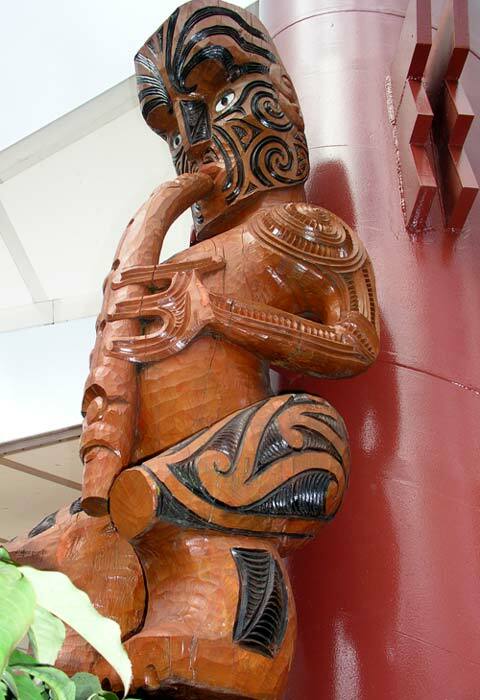 This carving of the legendary warrior, lover and musician Tūtānekai stands in Rotorua's city centre. According to the Te Arawa people, Tūtānekai lived on Mokoia Island in the middle of Lake Rotorua, and his lover Hinemoa lived on the shore of the lake. Hinemoa's family objected to their union, so she swam across the lake at night to join Tūtānekai, while he played his flute to guide her through the darkness. Some versions of the legend maintain that Tūtānekai was not actually the expert player he appeared to be, and that someone else nearby was producing the music.